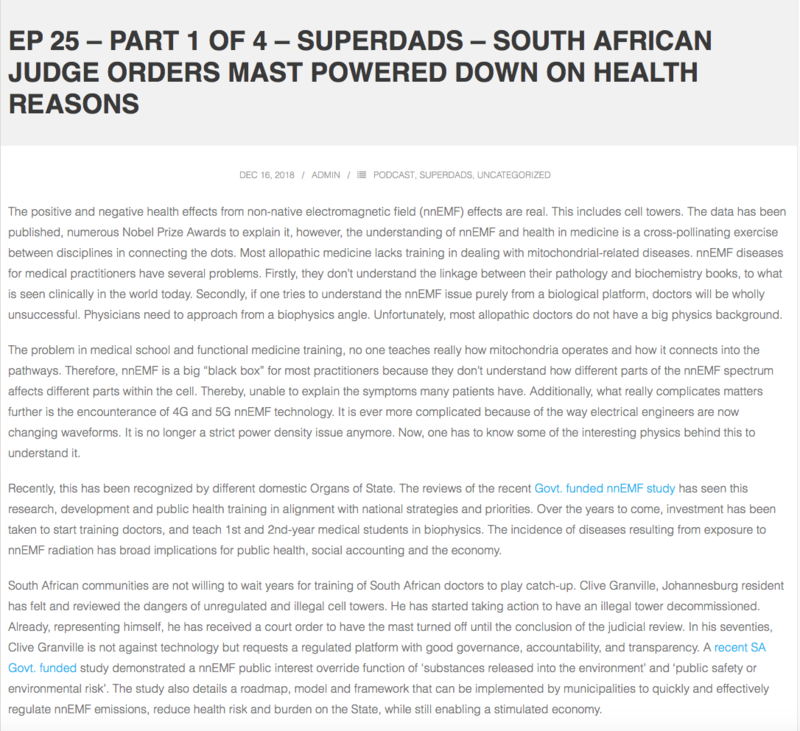 The problem in medical school and functional medicine training, no one teaches really how mitochondria operates and how it connects into the pathways. Therefore, nnEMF is a big “black box” for most practitioners because they don’t understand how different parts of the nnEMF spectrum affects different parts within the cell. Thereby, unable to explain the symptoms many patients have. Additionally, what really complicates matters further is the encounterance of 4G and 5G nnEMF technology. It is ever more complicated because of the way electrical engineers are now changing waveforms. It is no longer a strict power density issue anymore. Now, one has to know some of the interesting physics behind this to understand it. Recently, this has been recognized by different domestic Organs of State. The reviews of the recent Govt. funded nnEMF study has seen this research, development and public health training in alignment with national strategies and priorities. Over the years to come, investment has been taken to start training doctors, and teach 1st and 2nd-year medical students in biophysics. The incidence of diseases resulting from exposure to nnEMF radiation has broad implications for public health, social accounting and the economy. South African communities are not willing to wait years for training of South African doctors to play catch-up. Clive Granville, Johannesburg resident has felt and reviewed the dangers of unregulated and illegal cell towers. He has started taking action to have an illegal tower decommissioned. Already, representing himself, he has received a court order to have the mast turned off until the conclusion of the judicial review. In his seventies, Clive Granville is not against technology but requests a regulated platform with good governance, accountability, and transparency. A recent SA Govt. funded study demonstrated a nnEMF public interest override function of ‘substances released into the environment’ and ‘public safety or environmental risk’. The study also details a roadmap, model and framework that can be implemented by municipalities to quickly and effectively regulate nnEMF emissions, reduce health risk and burden on the State, while still enabling a stimulated economy. The story of Clive is similar the the American legal drama TV series, Suits, created and written by Aaron Korsh. Even though Suits is set at a fictional law firm, Clive mimics the focal point of the show as being the talented Mike Ross. From a young age, Clive displayed the skills set of retaining memory as he read, he is a speed reader, and has exceptional analysis speed processing skills While Clive is not an attorney, his life lessons and experience give him a good background. Plus, he was able to speed through case law and textbooks getting a competent understanding of South African legislation. In Clive Granville’s words: “I brought an urgent application. We were self-represented and I wrote the application and the argument. It was quite drawn out in verbal argument with Atlas tower and Telkom opposing. The City did not oppose or appear. The High Court in Johannesburg was very unhappy with the Council and with the Atlas for not notifying residents and for not checking on the unsightly impact and the Judge ordered the tower turned off because of the health impact on me. The Respondents and other parties have to show cause why it should not stay off until all litigation is complete. I got a fair and knowledgeable judge (Justice Cassim). He kept telling me he had read my papers. The fight will escalate, but it was a great victory because it was on the scientific basis of medical harm. When they cited ICNIRP and the WHO the judge asked them for their scientific evidence to support the lack of danger. The Telkom counsel said they would provide masses of scientific data in trying to get it turned on again, but I said “Bring it on”. We are still awaiting the Court transcript. Once they are received we will publish them in a new post. Be sure to subscribe in order to receive them. Thank you to SC for sharing this story with us @ Z5G!